Retail Price - Prix Client : 927,58 CHF tax incl. This philosophy is reflected in FL Studio 20’s flexible audio and control data routing, free-form Playlist design and interoperability with industry standards (VST/VSTi/VST2, DXi, DXi2, Buzz, ReWire, MIDI, MP3, WAV, OGG). Didier notes ”We don't try to protect our data & come up with new formats only for marketing reasons. 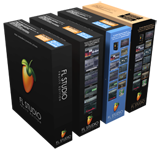 We use existing standards as much as possible, and allow FL Studio be used as a plugin in other hosts“. In version 9, particular emphasis has been given to improved workflow through enhanced interface design, so that ideas can be crystallized and creativity captured. FL Studio allows you to detach all windows of the program. FULL Signature Edition Bundle PLUS This Bundle includes ALL plugins (*), available at the time of purchase, at an incredible 65% discount! Click 'read more' in our web shop for a list of included software registrations. Make virtually any sound - FL12 includes over 30 software synthesizers covering acoustic/synthetic bass, electric guitar, multi-sampler tools including piano & strings, general sample playback and beat-slicing (With Rex 1 & 2 support).